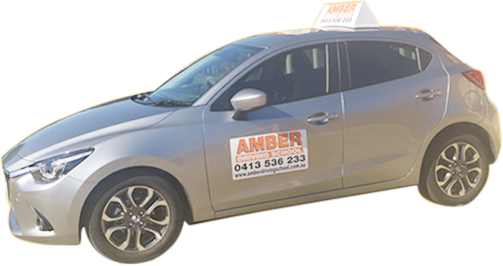 Amber Driving School operates and covers the following suburbs in Perth, Western Australia (WA):Alexander Heights, Balcatta, Balga, Ballajura, Beldon, Carine, Connolly, Craigie, Currambine, Darch, Duncraig, Edgewater, Girrawheen, Greenwood, Gwelup, Hamersley, Heathridge, Hillarys, Hocking, Iluka, Joondalup, Kallaroo, Karrinyup, Kingsley, Koondoola, Landsdale, Madeley, Marangaroo, Marmion, Mullaloo, North Beach, Ocean Reef, Padbury, Pearsall, Stirling, Sorrento, Trigg, Wanneroo, Warwick, Waterman, Watermans Bay, Westminster and Woodvale. Why do I need to check my mirrors and how often? mirror checks are for your benefit to see what is behind, and to the sides of you. they should be used for left/right turns,and every change of direction your car takes and the interior one for slowing down. As a rule the interior mirror should be checked every 6-8 seconds. The Amber light means the signal is about to change to red. If the light is Amber as you approach you are required to stop, if you can do so safely. Do I have to stop at a stop line? Yes , you have to stop completely within a metre of the stop line. When can I sit my test? Everyone learns at different rates so the amount of lessons will vary, practising with family and friends will give you more experience and get you to the test quicker.